The automatic French fries line is automatic from feeding material to finished potato chips. 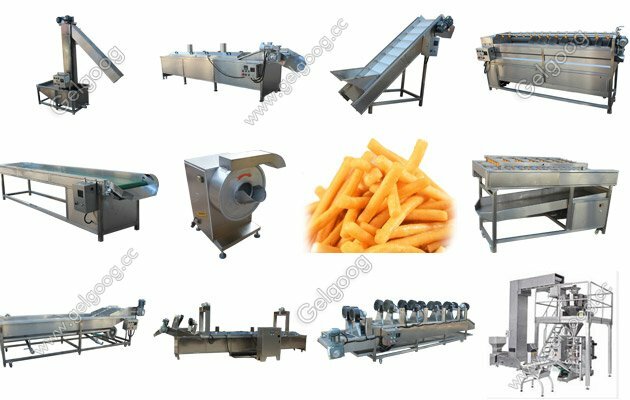 Full Automatic French Fries Production Line For Sale The automatic French fries line is automatic from feeding material to finished potato chips. There are some machines in the full automatic french fries line. By Elevator, the potato will come into the Pre-washing Machine, by brush roller and water spraying to remove the mud on the surface of potato. The electrical is Schneider, and frequency control motor. The Frequency converter from Japanese Mitsubishi. After pre-washing, the potato will come into the emery peeling machine to remove the peel. After processed by Emery roll and water spraying , the peel will be removed.Total 12 pcs of emery roller.At the bottom , it is with one water tank to recycle use the water, thus, it can saving water.The potato will be discharged automatically by screw. Peeling Time is adjustable, frame all with 50*50*2mm, superior Stainless Steel 304 tube, bearing is made of Stainless Steel 316 Bearings. All motors are with superior copper wire and adjustable-speed, working speed is adjustable. After the potato chips coming from the Impurity Removing Machine, the qualified potato chips will drop the Rinsing machine directly. 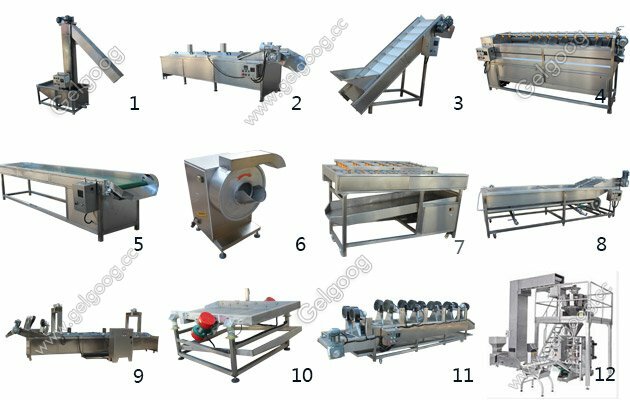 By bubble Agitator Wave Wash, the potato chips will be in roll state, thus it can remove the starch on the surface of potato chips.It also with second water spraying function. All bubble produce device are with speed adjustable. Its working principle is to send the potato chips by conveyor, after turn over many time to realize the potato chips will be wind uniform and polyhedral winded.By high press of wind of the fan,the water on the surface will be removed.the fan nozzle is with blade shape,it will improve the pressure of wind, and the water will be easier to be removed. In order to follow up process,there is one water received tank at the bottom of this amchien. Working Principle: after the potato chips send into the fryer machine, the oil temperature is 185centigrade, the second section will be set to be 160 centigrade. The third section temperature to be 120 centigrade. The potato chips will be fried for 1-2 minutes in oil. Then will be discharged out. 4.Emery Peeling Machine Total 12 pcs of emery roller.At the bottom.frame all with 50*50*2mm, superior Stainless Steel 304 tube, bearing is made of Stainless Steel 316 Bearings. Width of belt is 800mm. The motor is speed adjustable,made of Stainless Steel 304, all bearings are Stainless Steel Bearing. 16.Oil Filting Machine Then the oil coming from the filter discharge hole is qualified . then with pipes, the oil will be sent to fryer machine to finish static filting and finish the whole filting process. 17.Oil Adding Tank Oil Adding Tank is with heating device. It will heat the oil to the certain temperature. Then by recycle pump to send the oil to the fryer to realize the adding oil . Stainless Steel 304, thickness of 3mm, frame made of 100*50*5mm, superior stainless steel 304, vibrating motor of 0.25kw, amplitude is adjustable.